The long wait is nearly over. Starting October 11, Forza Motorsport 4 will be unleashed, and the world of automotive entertainment will never be the same. Featuring unmatched graphics and innovative features designed to push the racing genre in brand new directions, Forza 4 will be the ultimate playground for car fans. 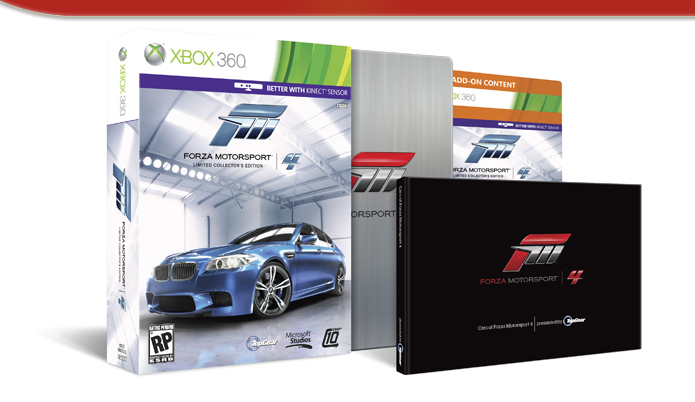 Today we've got the details on the Limited Collector's Edition of Forza Motorsport 4, which is also arriving starting on October 11. The Limited Collector's Edition will also include a ten-car add on pack featuring a selection of the best Classic American muscle cars. In addition, there will be custom-designed BMW cars (also available for purchase at launch on Xbox LIVE Marketplace) selected as part of the "Forza Motorsport 4 BMW Design Challenge", as well as "Cars of Forza Mototorsport 4 Presented by Top Gear", a gorgeous 96-page volume written by the editors at Top Gear. It features 96-pages of fantastic imagery both from Forza 4 and from Top Gear's extensive photo library, as well as insightful commentary accompanying the in-game Autovista experience. Other goodies include: a set of vinyl stickers featuring the logos of "Forza Motorsport 4", "Top Gear" and "Turn 10", VIP membership status within the Forza community including special recognition int he Forza community, leaderboards, ForzaMotorsport.net and more; and an exclusive BMW theme available for download via Xbox LIVE Marketplace. In addition to all the sweet stuff above, one of the best reasons to get the LCE version of Forza 4 is the 2012 BMW M5, unveiled for the first time as the newest addition to the Forza 4 lineup at this weekends 24 Hour of Nürburgring race event in Germany. The new BMW M5 will be drivable first in Forza Motorsport 4 and will also be featured on the cover of the LCE version of the game. That means the stunning super-sedan will be automatically included in the LCE version of Forza 4, and all Xbox LIVE members will be able to download the car to drive. In addition, fans will will be able to explore the meticulous design and impeccable execution of the BMW M5 via Autovista mode, where Top Gear's Jeremy Clarkson will take fans on a virtual tour of the world;s most sought-after cars. Stay tuned for more Forza Motorsport 4 news and announcements very soon!